An 11 day multidisciplinary field excursion was organized by Jacobs University Bremen and DLR Berlin to investigate the volcanic island of Vulcano, Italy, and the surrounding waters. 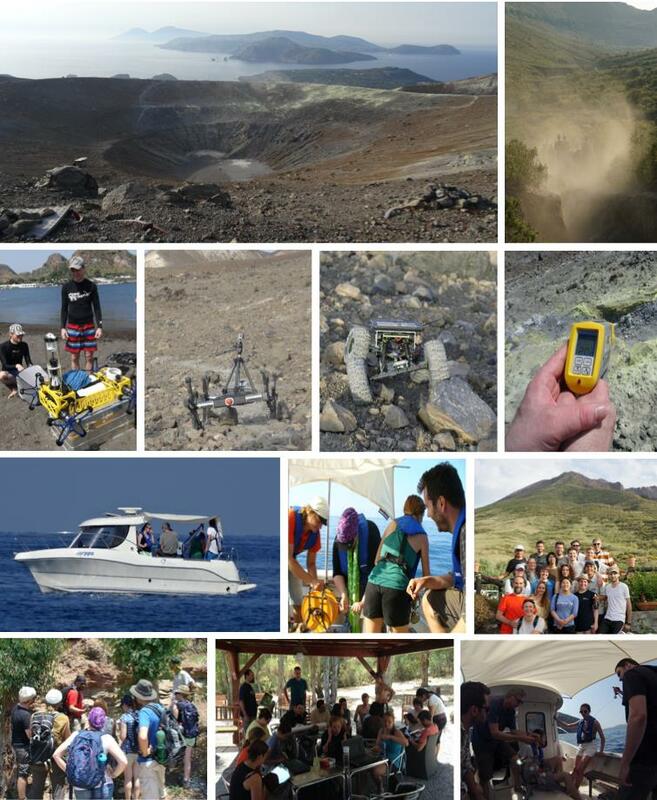 The excursion was open to the whole of the ROBEX community and comprised members from a range of partners, including DFKI, DLR, TU Dresden, MARUM, as well as Earth and Space Sciences students from Jacobs University. Vulcano is a dry, volcanic island exhibiting both active and dormant volcanic calderas, as well as marine and terrestrial gas venting. As such, it is an ideal planetary analogue for some solar system bodies, and a great location to test equipment as well as to conduct active and useful research. By combining excursion attendees into working groups, participants got the chance to take part in research both on land, and on the ocean, via the Jacobs University small research boat ‘Norppa’. A variety of research equipment was used to produce a dataset from > 400 research stations (figure 1). Oceanographic sensors used included a CTD, ADCP, magnetometer, sidescan sonar, various underwater cameras, pH and turbidity meters, dragnets and Nisken bottles. The large marine pH range found in the surrounding waters (6.5 to 8) correlated with video observations of change in marine communities. On land a seismic station was set up to measure activity during the excursion, thermal cameras and lasers used to investigate heat flux at active vents and various GIS measurements taken. The collected data is currently being collated into a GIS dataset which will be made publically available via PANGAEA. In addition to introducing the sensors to the participants, various ROBEX technical developments were tested, and in some cases compared with more traditional surveying methodologies. DFKI tested both marine and terrestrial ASGUARD robots for operability under various planetary analogue conditions (>10 video transects produced from various volcanic slopes). A small ‘rockhopper’ rover from Jacobs University was modified for scientific study in rocky planetary analogue conditions, carrying out >10 transects across various terrains. The marine ASGUARD was equipped with a novel 360 degree camera system, and the effectiveness of this camera for fish counts compared with more traditional lander techniques investigated. A concrete pressure housing developed within ROBEX by TU Dresden was also tested. The friendly atmosphere of the excursion was conducive to research, and two bachelor projects (land/ocean) with AWI and DFKI were kicked off during the 11 days. 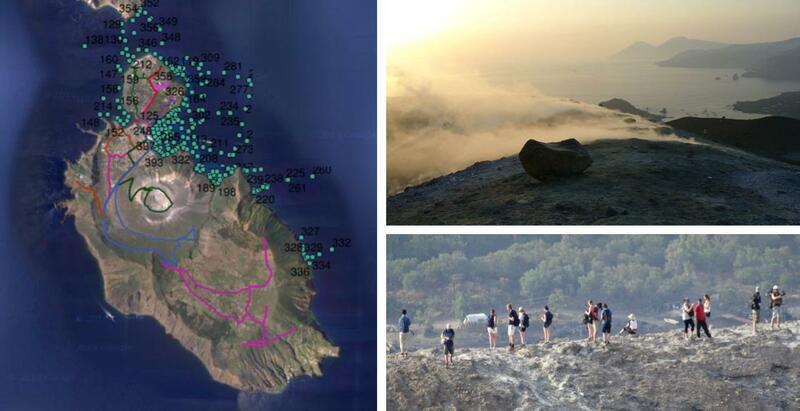 Also within the excursion was a boat trip to the Stromboli volcano and other volcanic islands in the vicinity. Additionally there was the chance to receive an overview of the work by the visiting ROBEX scouting mission currently planning the demo missions for ROBEX. 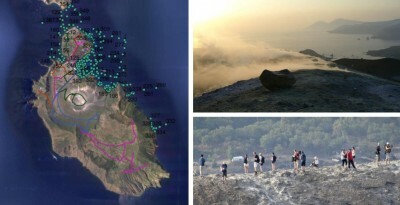 It is planned to return to the island next year, in the context of putting on an international summer school on extreme environment research, and to further test ongoing ROBEX technological developments in the field. Various views of activities underway are in figure 2.